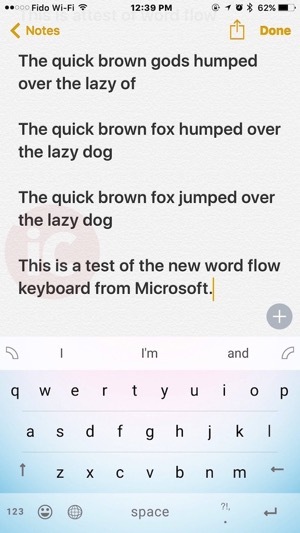 Back in January, Microsoft announced it would be bringing its Word Flow Windows Phone keyboard to iOS users. After an iOS beta test period, the keyboard launched today in the U.S. App Store. 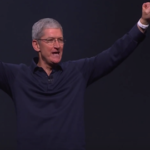 For Canadians, this means you will require a U.S. iTunes Account to download this app—click here to learn how to easily create a U.S. iTunes account without a credit card. 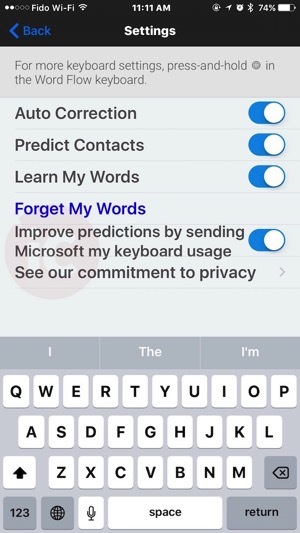 The keyboard has auto correct, will predict contacts, and also learn your words too. Below are screenshots of our first tests with Word Flow. 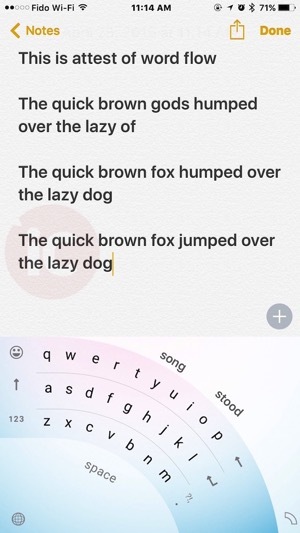 To move the keyboard so it curves to the bottom left or right, just tap and drag either the left or right ‘arc’ icon with either your left or right thumb to the opposite lower corner. This will move the keyboard to one corner into an arc shape, allowing you to reach every single letter of the keyboard. To move the keyboard back up, just drag the ‘arc’ icon back up. Word Flow has built in swipe typing, and as you can see once we slowed down a bit (and actually swiped over the proper letters), it was quite accurate. Word Flow also offers full emoji access, plus there’s a tap and hold shortcut for a question mark, exclamation point or period (you can also double tap the space bar for a period). This is a decent third party keyboard and we’re going to leave it as our main keyboard for the day or so. • Whether you’re tapping or swiping, Word Flow predicts what you’re trying to type and corrects mistakes. 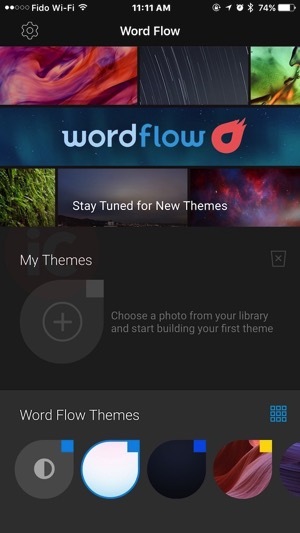 • Word Flow intelligently suggests the next word in your sentence, and gets better at it over time. • With access to your Contacts, Word Flow predicts the names of your contacts so you can go even faster. This is the second keyboard released by Microsoft Garage, the team behind experimental apps from the company. Earlier this month, the Hub keyboard made its way to iOS users, bringing better Office integration for sharing links to documents and more. Click here to download Word Flow for iOS in the App Store. Hopefully it hits the Canadian App Store soon. Let us know what you think of it.